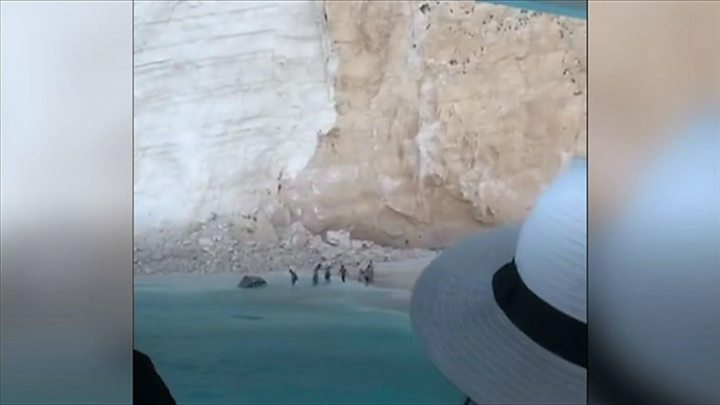 At least seven people were injured when part of a cliff face broke away at the popular Navagio beach on the Greek island of Zakynthos, officials say. "We haven't found any trapped people but we will continue searching," a spokesperson for the fire brigade said. None of the injuries sustained in the incident on Thursday afternoon are believed to be life-threatening. The beach, also known as "shipwreck beach", is popular with tourists and can be reached only by boat. "There was a noise and a small piece of rock fell, then a second bigger and finally a third big piece of rock that during the fall created a sea whirlpool that overturned the boats," one eyewitness said. Greek authorities said they had received no reports of missing people but that search and rescue teams were continuing to operate by air and sea into the late afternoon as a precaution. Among those injured was a 34-year-old woman from the Czech Republic, who suffered a fractured vertebra. Her husband and two children were also treated for minor injuries by hospital staff, according to the Greek news website Kathimerini. The port of Zakynthos, which is also known as Zante in Western Europe, was evacuated as a precaution. It is one of the Ionian island's main attractions, in part because of the shipwreck on the shore and also because of its surrounding steep cliffs.